The AmDTuning.com with Cobra Exhausts team secured it’s best result of the season to date as the Dunlop MSA British Touring Car Championship headed for Silverstone for the penultimate meeting of the year. The West Thurrock-based team travelled to the Northamptonshire circuit seeking to maintain the solid form shown at Rockingham in the previous meeting, with both Ant Whorton-Eales and Ollie Jackson keen to challenge for points. 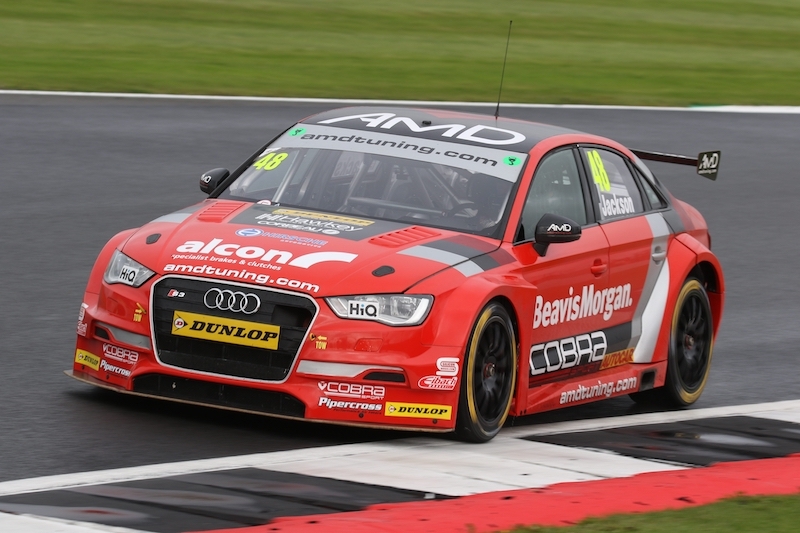 Lichfield racer Ant would prove to be one of the stars of qualifying as he put his Audi S3 in seventh place on the grid; the best qualifying performance for the car to date. Despite dropping a place on the opening lap, Ant would fight his way up as high as fourth as the race wore on and was sitting in sixth when an accident elsewhere forced officials to bring the race to a halt. Race two would prove to be a more challenging affair as Ant struggled to match his pace in race one, and contact from the VW of Jake Hill on the Wellington Straight saw him suffer a high-speed spin that dropped him down the field. Crossing the line in 23rd, Ant would then fight back through the pack well in race three to finish 13th and pick up a second points finish of the weekend. “It’s been a good weekend and I’m pleased to come away with my best qualifying performance and my best race result so far,” he said. “We showed really good pace in race one and it was great to run at the sharp end of the field. “I’d hoped to try and match it in race two, but we didn’t have the same speed in the car for some reason, perhaps because of the extra success ballast we had to carry. Being turned round on a straight wasn’t a nice experience either and I was lucky that the guys behind didn’t collect me when I was sent spinning off at Brooklands. It’s a high-speed part of the circuit and to get taken off like that is just dangerous. Despite being under half a second away from pole, Ollie found himself starting race one from 20th place in the sister car but also showcased the speed of the Audi with an impressive drive to the fringes of the top ten. Having got as high as twelfth before the race was stopped, the Tamworth racer was well placed to push into the top ten in the second race but instead saw himself unclassified after heavy contact to the rear forced him to pit for repairs. Luck then went against Ollie in race three when an incident ahead left him with nowhere to go when he came across cars blocking his path on the exit of Luffield, and despite taking to the grass in avoidance, a heavy hit to his Audi put him out on the spot. “The positive to take away from the weekend is that we showed again that we have a fast race car,” he said. “We took a step forwards from qualifying in the first race and it went really well. The slippery conditions on track really suited me and we made the most of it to push towards the top ten – which I think we could have achieved if the race hadn’t been stopped. “From that point though, we’ve been robbed of the chance to fight for some top ten finishes by the same idiots who get involved in things over and over again. The levels of contact aren’t acceptable and instead of a good haul of points, we’re going away from Silverstone with a badly damaged car and a big repair bill ahead of Brands Hatch. Team boss Shaun Hollamby admitted that the race weekend had left him with mixed emotions having displayed the highs and lows of the sport. “On one hand, we’ve picked up our best starting position and best result so far with the Audi, but on the other hand we’re also taking a damaged car back to base through no fault of our own,” he said. “Both Ant and Ollie have done a good job this weekend and have shown really good pace, particularly in the opening race. “We should have been able to build on that in races two and three but stupid incidents that could – and should – have been avoided mean we’ve only picked up one more points finish and have got one badly damaged car.